I concur. Palmately compound leaves with 5-7 leaflets, lovely in spring, summer and fall. Multi-stemmed shrub to 10-12 feet with layered tiers of branches. Suckering habit that results in wonderful groundcover colony to complement mass plantings. And the flowers are the real door prize. Creamy white 4-petaled flowers with protruding stamens with pink to red anthers. Overall effect of upright panicles is glorious in early summer. 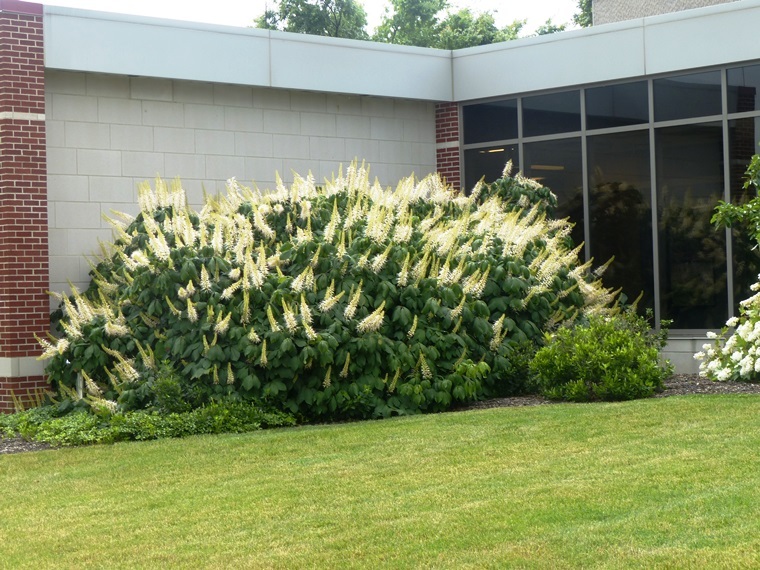 Pollinators, from butterflies to hummingbirds love bottlebrush buckeye. Fruits smaller than the average buckeye, but interesting. Best soil is moist, organic, well-drained: what else is new? Partial to full shade. Slow to get started but worth the wait. Few pest and disease problems; low susceptibility to Guignardia leaf blotch disease. Reportededly not a favorite for deer palates. Not sure what this is in late summer: Bracts? In recent years moved to the Sapindaceae, the soapwort family. Native to the southeast United States and found and described by early plant explorer William Bartram in the Carolinas and Georgia in the 1770s. Many gardening awards in the U.S. and the Royal Horticultural Society (Award of Garden Merit). “Perhaps seed could be collected and we could try some vegetative propagation as well” Will do. One final note: Even the physiological leaf scorch can be beautiful on bottlebrush buckeye.